I’m guessing the “miles” are worth one cent when redeeming for travel, but I can’t tell for sure. Based on the promotions on this page, they’re worth less than one cent when redeeming for other things. So: $250 on travel plus another $330 back per year on travel spending (if you max out). There’s a business card version as well which also carries the 25,000 mile bonus, albeit with a $3K minimum spend. 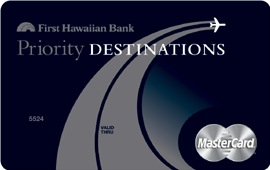 The way it’s worded makes me wonder, though: if you happen to be in Hawaii on vacation, could you walk into a First Hawaiian Bank branch and apply for the card? I have no idea, but I figured I’d throw this one out for consideration in case anybody’s familiar with it, or in case I actually have any readers in Hawaii. here is your Hawaii reader. I looked at it once but the bank teller couldnt tell me how to redeem the pts so i didnt look at it again. i wonder if it is as easy to redeem as the Arrival card. I am rapidly becoming a phenomenon in Hawaii!